The small propeller plane skims low over the Irish Sea to touch down onto the tiny landing strip of Ronaldsway Airport. This is the Isle of Man. A 221 square mile Crown Dependency situated between the UK mainland and Ireland. It is probably most famous for the TT motorcycle race which does a lap out of the circumference each year. The other thing it is most known for is its favourable tax conditions. I’m visiting for the launch of its new IT campus. Developed as a public and private partnership between University College of Man (UCM) and International Centre for Technology (ICT), this aims to provide a funnel for the IT skills needed on the island. Because contrary to the bucolic scenes of rolling green countryside and cows grazing near the airport, the Isle of Man has excellent IT infrastructure. This includes 100% broadband penetration (to a population of 85,000), five tier three datacentres and good renewable power, the excess of which is sold on to the National Grid. This and the tax breaks makes it an ideal home for a wide range of technology companies. In a potted history Brian Donegan, Head of Operations for the Isle of Man Government’s eBusiness and FinTech Innovation, explains that although the island has been a financial services centre since the 1970s, in the early noughties it looked to diversity and became a hub for eGaming. This now makes up 19% of the economy and because of it the island had to learn to mitigate the risks so “became very good at regulation”. “That was the beginning of digital businesses,” he says. FinTech especially has emerged into this slipstream and the Isle of Man is becoming a bit of a leader for digital currency businesses. Credits – which was recently awarded a contract to supply its Blockchain-as-a-Service offering to the UK public sector – is based on the island and trialled its service here first. 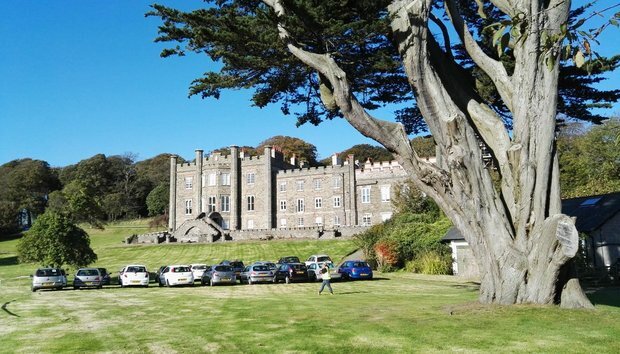 The new campus is housed in an old nunnery – which looks like a castle – and plans to tackle this skills shortage head on. It offers an incentive for local school leavers to stay on the island to complete their tertiary education and aims to deliver a steam of qualified talent for local businesses. Part of the appeal for youngsters and businesses alike is the facility will look to run business and IT degrees along with useable vocational skills. David Butterworth, the Founding Director of the Manx Educational Foundation explains how his charity will be offering students the chance to gain industry accredited training, along with setting up paid work experience in local firms, which need the skills. This should allow individuals to gain up-to-date qualifications in relevant IT packages along with the broader theoretical education provided by a computer science degree. This seems especially pertinent at a time when many people are actively choosing between a full degree or a quick bootcamp. Jo Pretty, the new Principal of UCM, who recently moved over to take the position says, many organisations are trying these types of initiatives. Some are successful and some are not, but she believes success tends to stem from the “will to make it work”. From a student perspective, the Isle of Man has excellent funding which makes degrees far cheaper than the rest of UK. Until 2014 the government even paid the majority of the fees for those who wanted to study on the mainland. I speak to three final year students who tell me despite this financial change most of their school friends crossed over to England to study. There are fewer degree choices on the island – especially for solid academic subject like English or history – but for the three individuals I talk to say it was an easy choice to stay. They can live at home, are not racking up huge debts and can gain invaluable industry work experience that leads to actual employment at the end of it. Kristan McDonald, Managing Director of Manx Technology Group (MTG) one of the businesses involved in the new facility, says part of the challenge is always “getting people to accept that the Isle of Man is a place where people can have a career”. He himself came from the island, went away to study and then came back. He says he may have stayed if similar opportunities were available back then then. Katie Nicholson, Manager of local Angel network, Bridge did a similar thing and agrees. “You can go away later,” she says. UK: Is a ‘coding retreat’ better than a computing degree?